It's time to shine Canada. The Olympics are in Vancouver: my home town. I won't be there and truth be told I'm not happy about that - but I'll be watching. Friends and family are volunteering, and have seen the torch. The rings are lit up downtown and now it's all about to begin. 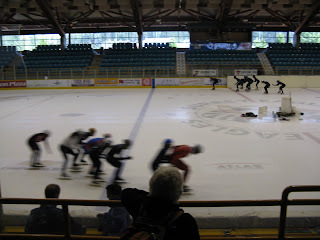 We were lucky two summers ago to see the USA short-track team practise at our local rink for five days. 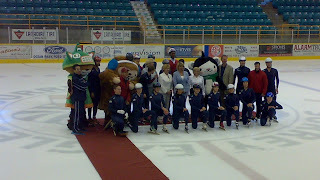 The Olympic mascots came and we had lots of opportunities to take photos. Michael was in Vancouver last month and brought back some Olympic souvenirs. One big towel with Quatchi on it hangs in Craig's classroom, the other one in our living room. The kids are proudly wearing their Olympic t-shirts and pins. We'll be up early Saturday morning (our time) to watch the opening ceremonies, and I'll be thrilled to see coverage of Vancouver. Here in India there has been no mention of the Olympics. People I've mentioned it to (expats) have no idea that it starts this week and many ask winter or summer? Ahhhhh. I just read that there are three people on the Indian Olympic team - luge, alpine skier, and a cross country skier. The poor guys have no funding and didn't even have uniforms for the opening ceremonies. Some Canadian company heard about it and stepped in to make some for them. It's truly a once in a lifetime opportunity - to watch the Olympics in person in your hometown. I have to pass on that one unfortunately, but like I said - I'll be watchin'. the torch relay last night at 4th and Burrard!